Peanut Butter Chocolate Granola Bars. I may never buy another another granola bar ever again. I did some digging around, and compiled ideas from various recipes, eventually evolving them into my own concoction. I modeled these after my favorite store bought variety. Naturally [or well, unnaturally] store bought bars have all kinds of ingredients that aren't necessary or good for you, despite them all having the predisposed idea of being healthy. I used only ingredients I had around the house, and lucky for me, I keep a good variety of nuts in stock [not a reference to me or my family's insanity], as well as seeds and grains. I'm insanely proud of these bars, since they're incredibly filling, healthy and delicious. Preheat oven to 325 F. Lightly grease an 8 by 8-inch baking dish and set aside. In a large bowl stir together oats, nuts, sunflower seeds, flax seeds, cinnamon and salt. Pour butter mixture over oat mixture and stir until combined well. Add the egg whites and stir until combined. On a large baking sheet, [if you have a silpat sheet, use it!] spread the granola evenly in a thin layer. Bake, stirring every 5-10 minutes to keep from sticking or burning, until golden brown and crisp, about 20 minutes. Cool the granola and place in a large bowl. Combine the brown sugar, corn syrup, and peanut butter in a small saucepan over medium-high heat. Stir constantly until the sugar is dissolved and the mixture is at a boil. Remove from the heat and pour the mixture over the granola, stirring to coat well. Cool slightly and add in chocolate chips. Press the mixture into the prepared baking dish and let cool completely and harden. Cut the mixture into bars and serve at room temperature. In "agave", "almonds", "chocolate", "cooking", "flax", "granola bar", "healthy", "honey", "macadamia nuts", "oats", "peanut butter", "pecans", "recipe", "sunflower seeds", "walnuts"
I threw this recipe together a while back, and was UNBELIEVABLY pleased with how it turned out. I took numerous photos [all of which were lost in a certain battle with my camera and laptop...don't remind me]. I was initially planning to make a pan-asian style dish, and had just purchased a great piece of swordfish. As I pondered through my pantry of spices, I noticed these Sun-dried tomato flakes from Williams Sonoma. They were part of a spice set I got as a Christmas gift, and I had never used them before. I was determined to give them a try, and thought combining Asian and Italian influenced food couldn't hurt [or if it did, it was only hurting myself and my mom who I was cooking for!] It turns out, combining these two cultures in cuisine wasn't half bad! 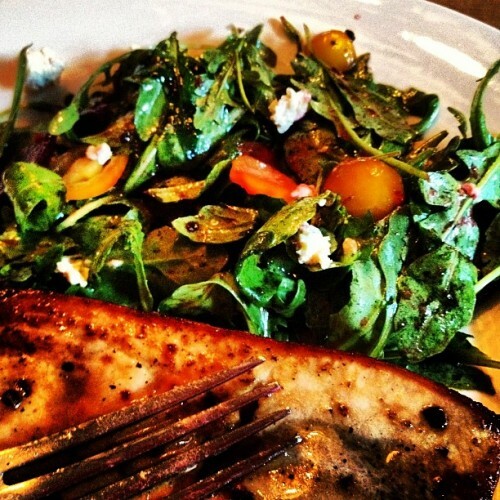 Pan Roasted Swordfish with a Honey Ginger Sun-dried Tomato Glaze with arugula, lovebeets, goat cheese and baby heirloom tomatoes. Combine marinade ingredients with a whisk and cover swordfish. Marinade anywhere from 20 minutes to an hour [I made this on the fly, so I was just under 20]. Lightly rinse off fish [don't be too thorough, or you'll lose all the flavors from the marinade!] and pat dry. Season with coarse salt and pepper. Heat olive oil in a skillet on medium high heat. Pan fry fish 3-4 minutes per side, or until a golden brown crust forms [I like a slightly charred taste on swordfish, so sometimes I'll raise my heat if I don't see this golden color forming fast enough]. Remove fish from pan and allow to rest while assembling salad. Whisk together dressing ingredients in a large bowl [at this point, I remove some into a small saucer, to save for drizzling over the fish at the end]. Toss arugula, heirloom tomatoes and lovebeets in the dressing. Dot with goat cheese and serve immediately. In "arugula", "asian", "cooking", "extra virgin olive oil", "fish", "food", "goat cheese", "healthy", "honey", "italian", "lovebeets", "pan-seared", "recipes", "soy sauce", "sun-dried tomatoes", "swordfish"
Lavender Thyme Roasted Chicken & Brussels Sprouts in a Honey Glaze. I have an overabundance of fresh herbs this summer, so I've been trying to come up with new ways to use them. I love the combination of lavender and honey in this recipe. Preheat the oven to 450F. Liberally season the inside of the chicken with salt and pepper. Place in a roasting pan. Insert the bulb of garlic, lemon and sprigs of thyme inside chicken. Truss the chicken's legs [these reusable silicone rubber bands are perfect for this] and fold the wings inward [I forgot to take a photo of this process, but it's pretty simple. This blog shows photos of how I like to fold the chicken wings]. Rub 1-2TBsp. olive oil all over the chicken, then rub with the lavender and thyme [reserve some for the brussels sprouts] and season with salt and pepper. Place in the oven for 15-20 minutes, or until the skin begins to crisp. Remove the chicken from the oven and spread the brussels sprouts around the chicken. Drizzle the remaining olive oil on the brussels sprouts and sprinkle with remaining herbs. Season with salt and pepper. Return the chicken to the oven for another 20-30 minutes, or until the chicken reaches an internal temperature of 160F. Keep an eye on the brussels sprouts. If they begin to brown too much, remove them from the oven, and allow the chicken to continue cooking. Immediately after removing from the oven, drizzle honey over the chicken and brussels sprouts. This makes a wonderful, sweet glaze. In "brussels sprouts", "cooking", "honey", "lavender", "recipes", "roast chicken", "thyme"